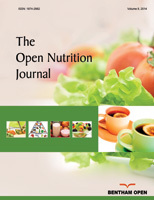 The Open Nutrition Journal is an Open Access online journal, which publishes Research articles, Reviews and Letters and guest edited single topic issues in the field of nutrition, aiming at providing the most complete and reliable source of information on current developments in the field. This journal publishes open access reviews on recently published books (both print and electronic) relevant to the journal. Publishers and authors of books are invited to contact our book reviews editor at tonutrj@benthamopen.net with book review requests. All submitted books will be reviewed by an independent expert in the field. No page charges will be levied to authors for the publication of book reviews. Abbreviations use should be restricted to a minimum. All non-standard abbreviations should be listed in alphabetical order, along with their expanded form, defining them upon the first use in the text. Non-standard abbreviations should not be used unless they appear at least three times in the text. If abbreviations are used in the text either they should be defined in the text where first used, or a list of abbreviations should be provided. Jeffery RW, Wing RR, Sherwood NE, Tate DF. Physical activity and weight loss: does prescribing higher physical activity goals improve outcome? Am J Clin Nutr 2003; 78: 684-9. Young VR, Tharakan JF. Nutritional essentiality of amino acids and amino acid requirements in healthy adults. 2nd ed. In: Cynober LA, Ed. Metabolic and therapeutic aspects of amino acids in clinical nutrition. Boca Raton, FL: CRC Press 2004; pp. 439-70. Shils M, Shike M, Olson J, Ross AC. Modern nutrition in health and disease. 9th ed. Baltimore: Lippincott Williams & Wilkins 1998. Paul AA, Southgate DAT, Eds. McCance and Widdowson's. The Composition of Foods. 4th ed. London: HMSO 1978. Harnden P, Joffe JK, Jones WG, editors. Germ cell tumours V. Proceedings of the 5th Germ Cell Tumour Conference; 2001 Sep 13-15; Leeds, UK. New York: Springer 2002. Sinha A, Madden J, Ross-Degnan D, Soumerai S, Platt R. Reduced risk of neonatal respiratory infections among breastfed girls but not boys. Pediatrics [serial online] 2003; 112:e303. Internet: http://pediatrics.aappublications.org/cgi/content/full/112/ 4/e303 [accessed 14 October 2003]. Abend SM, Kulish N. The psychoanalytic method from an epistemological viewpoint. Int J Psychoanal 2002; 83(Pt 2): 491 5. All authors must strictly follow the guidelines below for preparing illustrations for publication in The Open Nutrition Journal. If the figures are found to be sub-standard, then the manuscripts will be rejected.